The 9RX Narrow Track Tractor will be on display at the Commodity Classic. This year, John Deere has announced that it will be participating in the 2018 Commodity Classic between February 26 and March 1, to be hosted in Anaheim, California. The event is one of the largest farmer-led, farmer-focused convention and trade shows in the country. John Deere will be exhibiting its new Gator XUV865, R4038 Self-Propelled Sprayer, 9RX Narrow Track Tractor, Operations Center & Precision Ag Technologies, and 8R Row-Crop Tractor in Hall B at Booth #2768. 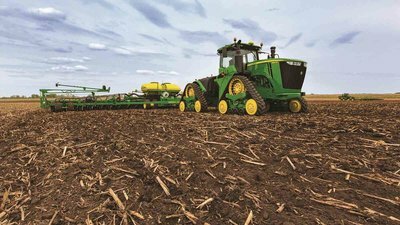 To learn more about Deere and its equipment, attendees can stop by on Tuesday, Feb. 27, between 10 a.m. to 11:30 a.m., and 3:30 p.m. to 4:30 p.m., or on Wednesday, Feb. 28, from 11 a.m. to noon. For this year’s event, U.S. Secretary of Agriculture Sonny Perdue will be the keynote speaker. He has served as a board member for the National Grain & Feed Association, and he has also been the president of both the Georgia Feed and Grain Association and the Southeastern Feed and Grain Association. There will be several other speakers on hand for educational sessions throughout the event as well, including Al Kluis, editor of Successful Farming, and Marji Gauyler-Alaniz, president and founder of FarmHer. Panel discussions including high-yield farmers and agribusiness executives will also be held on the Main Stage. “The Commodity Classic Main Stage provides yet another venue for attendees to gather critical information and insight for their operations,” said Gerry Hayden, a Kentucky farmer and co-chair of the 2018 Commodity Classic.